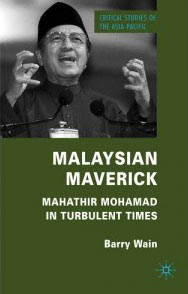 MALAYSIAN MAVERICK: Mahathir Mohamad in Turbulent Times - Barry Wain's revealing study of Dr M's 22-year term as Malaysian prime minister was published in 2009 by Palgrave Macmillan. The first shipment of the hardcover edition was detained in December 2009 by the home ministry when it arrived in Port Klang. More than three months later, no formal announcement has been made as to whether the book is banned in Malaysia. As a result local booksellers have held back on ordering the title in case the home ministry confiscates all copies, as it is wont to do with any literature deemed embarrassing to Barisan Nasional. A group of dedicated souls have now begun to upload in pdf format low-quality scans of Barry Wain's highly readable and well-researched book. This makes the material accessible to anyone with an internet connection, even if it unfortunately deprives the author and publisher of some revenue. I have just skimmed through Chapter Five of Malaysian Maverick and can attest to the robust quality of Mr Wain's research and the lucidity of his writing style. Barry Wain has done us all a magnificent service by publishing this important work which effectively deconstructs the demiurgic façade carefully and cynically built up by Mahathir's professional spin-doctors. It only takes a few paragraphs to show up Dr M for what he essentially is - just another snake oil salesman with a terminal case of megalomania, in vigorous denial of his own dark and dangerous side. 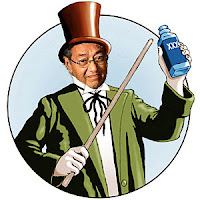 Of course, Mahathir couldn't have singlehandedly destroyed the nation's moral core - he was more than ably aided by the archetypal Mafia don, Daim Zainuddin, who subsequently served Mahathir as finance minister. The first shipment of Malaysian Maverick was finally released by the home ministry a few months after being impounded and copies are currently available at major bookstores. Barry Wain is a writer-in-residence at the Institute of Southeast Asian Studies in Singapore. An Australian journalist who has lived in Asia for 38 years, he is a former editor of the Asian Wall Street Journal. He is currently working on a thematic treatment of Southeast Asia since World War II that will draw heavily on his extensive reporting in the region. The really dangerous nuts of history have been motivated by hate. This particular nut - who almost succeeded in turning envy into virtue and natural justice on its head - could have been motivated by something as personal as his father abandoning his mother for another wife in India. However, there is only so much excrement you can throw at one person and get it to stick. All major atrocitices (acute social illnesses) and long-term injusticies (chronic ones) have been achieved with the complity of many. This includes victims who accept fatality and macochism in its brilliantly creative forms. Note: One of Hitler's generals was a Jew. He's not a snake oil saleman but the SNAKE itself!